This is BMW’s 2017 K1600GTL super-tourer in all its glory, scooped just days ahead of its anticipated unveiling in Germany at next week’s Intermot show in Cologne. The class-defining inline-six has been a strong part of BMW’s range since it burst onto the market in 2010 as a two-model range comprising the sportier GT, and the more relaxed and distance-focused GTL version. BMW then added a GTL Executive, laden with even more creature comforts. The changes might not be immediately apparent, but the closer you look, the more you will see. The one element that appears to be unchanged is the main headlight cluster, which sits in a reshaped nose with larger extensions either side to deflect air around the bars and rider, improving airflow and reducing turbulence. There are also new more aerodynamic mirrors and a wide, tall screen – which is certain to continue to boast electronic adjustability. While the 2016 bikes cut the air with decent clarity, there was certainly still room for improvement. The screen will be key to this, as it was hard to find an optimum position that offered enough respite from windblast, without the envelope of air pressure forcing you forward towards the clocks. Look a little lower, and it’s clear that the side panels are also new. They lack the large flat expanses of the current model K1600GT and GTL’s flanks and have more complex shapes and contours. There’s no obvious mechanical reason for the changes, which suggests they could also have been engineered for aerodynamic benefit. 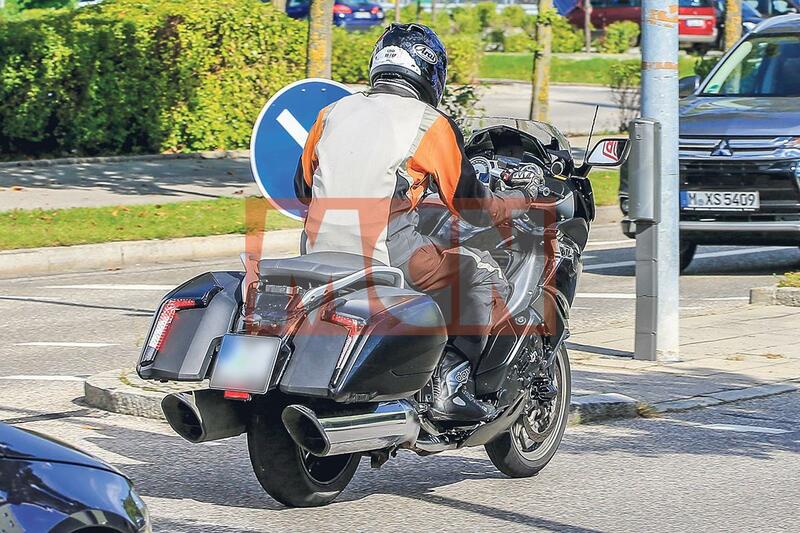 The new fairings also better frame the K1600’s engine, while the bellypan underneath now appears to be longer than the outgoing model’s, extending further back over the exhaust heat shields on the right flank. With so many changes to the shape of the fairing, it was then inevitable that BMW would have to give the expansive tank cover the same treatment, and while we can’t see the whole tank due to the rider being onboard in all shots, it has clearly been reprofiled. Capacity is expected to remain the same. Another change that was clearly evident on the patents which related to the Bagger version (see belowt) relates to the cover over the left hand side of the transmission, which is also new. The most likely explanation for this change is the introduction of the firms excellent Gear Shift Assist Pro system that’s already available on their flagship sportsbike, the S1000RR, as well as the more touring orientated S1000XR, and the entire R range of boxer twins. The system allows the rider to make clutchless shifts both up and down through the gearbox, working as a conventional quickshifter on up changes, and automatically blipping the throttle on down changes. While this may seem like overkill on a touring bike, in practice it’s a tangible improvement in terms of usability, and smoothness on the road – for both rider and pillion. We can only guess at any other electronic aids, but as the K1600 was already well catered for, there were few elements missing. The addition of cornering ABS would be logical and welcome. There has been no further word from BMW about their connected drive initiative, where bikes and cars will communicate with each other to help improve road safety – but recent news regarding their Intelligent Emergency Call system would seem to suggest that it will feature on a 2017 model – and the K1600 family is a prime candidate. It’s impossible to be sure from these images what changes have been made to the K1600’s suspension. The rear shock is more enclosed (and we can see a new auxiliary power output nestled there, too), and it seems likely that the firm will have updated their excellent ESA system for this new family. The range could be unveiled as early as next week, while BMW will have a second chance at the EICMA show in Italy in early November, with availability likely to be early Spring 2017. 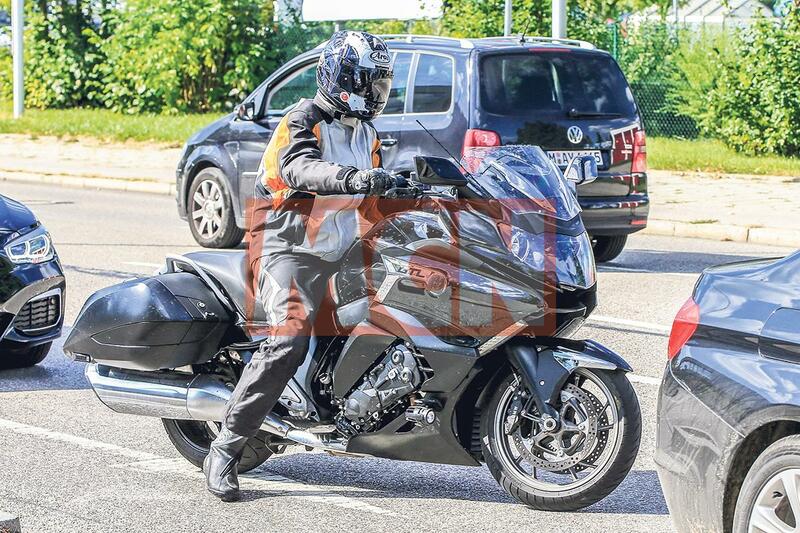 This is BMW’s secret new K1600 Bagger, spied testing on two occasions last week in Germany. The new addition to the K1600 family is essentially a GTL from the front to the footpegs, where it morphs into an entirely different beast – which will expand the model’s appeal massively in the American market. The badging on the fairing of the test mule clearly says ‘GTL’, suggesting that it’s the more relaxed touring spec model which underpins the Bagger – which makes complete sense for rider positioning. At the heart of the Bagger is the same 1649cc across-the-frame straight six, which is unlikely to be retuned from the 160bhp it produces in the GT and GTL super-tourer models – while new Euro4 compliance may have a marginal impact on the claimed power output across the range. The most obvious changes are at the back, where the conventional tail of the GT and GTL makes way for a redesigned rear end with drooping panniers, a lower pillion seat and long, horizontal exhausts. Patent images uncovered by MCN earlier this year hinted at further subtle bodywork changes for the Bagger compared to its stablemates, but it now looks like the changes were intended for the entire three-bike line-up, with only the headlamp appearing to be carried over. The aluminium frame, with its Duolever front suspension and Paralever rear, appears fundamentally unaltered, and all three models are likely to share the same instrumentation, wheels, brakes and electronics. It’s unclear if this model will be unveiled at next week’s Intermot show, but few are likely to come to the UK – meaning it’ll be a rare sight on Blighty’s boulevards.